Tillinghast gave Ridgewood three outstanding nine-hole courses in 1929, compilations of which have combined for tournament play over the last century. Although the greens are not exceptionally large, averaging 5,000 to 6,000 square feet, many bear the original Tillinghast touch – severely sloping, typically from back to front, and protected by deep bunkers at the front corners. These features are overshadowed by the century-old trees that line the fairways and frame many of the greens, making position off the tee such a key ingredient for scoring well, often forcing the better players to club down for accuracy. The trees also serve to isolate each hole from those nearby, creating a scene of splendid tranquility. The challenges are one after another-there are really no let up holes-good scoring demands consistent and creative execution. The old brick and stone European country style club house is a signature of the time this club was built . The club house interiors, locker room, and grill room are classic period designs without a hint of pretentiousness-they speak a quiet confidence of the history of this place. Plaques on the staging patio remind you that the course has been the site of major national golf events from 1935 to today-they include The Ryder Cup (1935), U.S. Senior Amateur (1957), U.S. Amateur (1974), U.S. Senior Open (1990), Senior PGA (2001), and The Barclays Championship (2008-10-14)-winners include well know players like Kathy Whitworth, Jerry Pate, Lee Trevino, Tom Watson, and Matt Kuchar. The club had been the home of one of the most famous club pros of his era, George Jacobus and he mentored Byron Nelson as his summer assistant back in the 1930’s. Byron credits the development time spent at Ridgewood under the eye of George Jacobus as the most important in his career. There remains a plaque on the end of a patio commemorating a shot Byron hit as part of a bet with some caddies-they threw down three balls and bet him he could not hit the flagpole about 150 yards away. With a three iron in hand Byron plunked the flagpole on his second try to collect the winnings. The first thing you notice is the segmentation of the holes created by the towering trees. The spacing of the trees is generous so wayward shots still allow a path to recovery-but the thickness of the rough makes you pay the price for being off line with your tee ball. 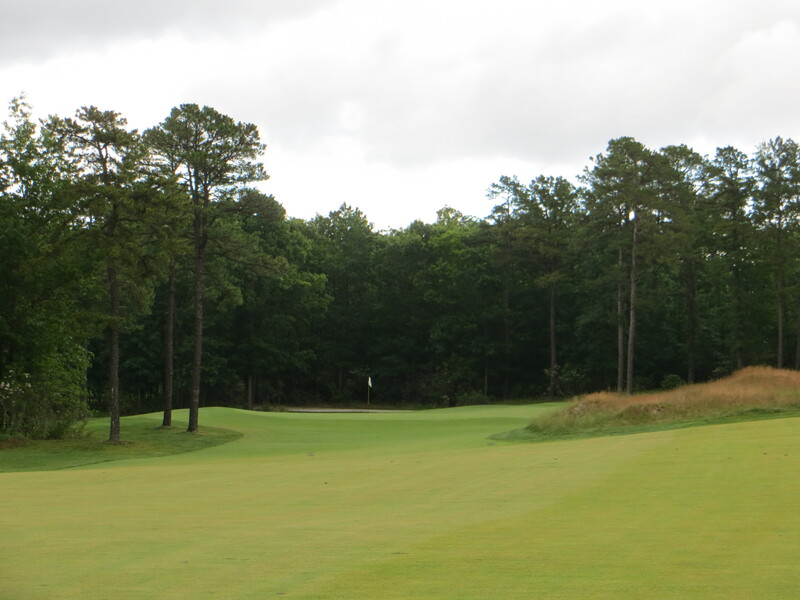 The center nine is built on the highest part of the property so the holes there have the greatest bit of topographical influence-the east and west nines fall to the sides of this high ground and provide lots elevation change and side slope stances and rolls. The combination of the trees dictating shot line and positioning along with the tactical fairway and greenside bunkering make you engage the trouble for the most aggressive shot lines. The creative nature of the green complexes means you will miss greens and have many pitch and chip opportunities to save pars-it will take good short game skills to be successful around here. One nuance is that, in spite of the fact that most greens have open front access, most have a gentle lip on the front of the green which makes pitching and chipping to front and middle pin placements very challenging. We are not talking false fronts but just enough lip to the green to make the player very indecisive as to whether to keep the shot on low to the ground or force it over the front edge of the green in the air. Fast greens just complicate this decision. One of the most dominant features to negotiate is the grain on these greens-it generally runs across the property toward the highway-everything breaks toward the traffic noise-now that is different. With the slope in these greens and the dominant grain fast green speeds can make this a real test of patience and discretion. For all of the difficulty articulated the course is very playable for the average player-the challenges are obvious and doable for someone with discretion. Score can be protected when the challenge is too steep and there are scoring opportunities to be seized at the appropriate time. 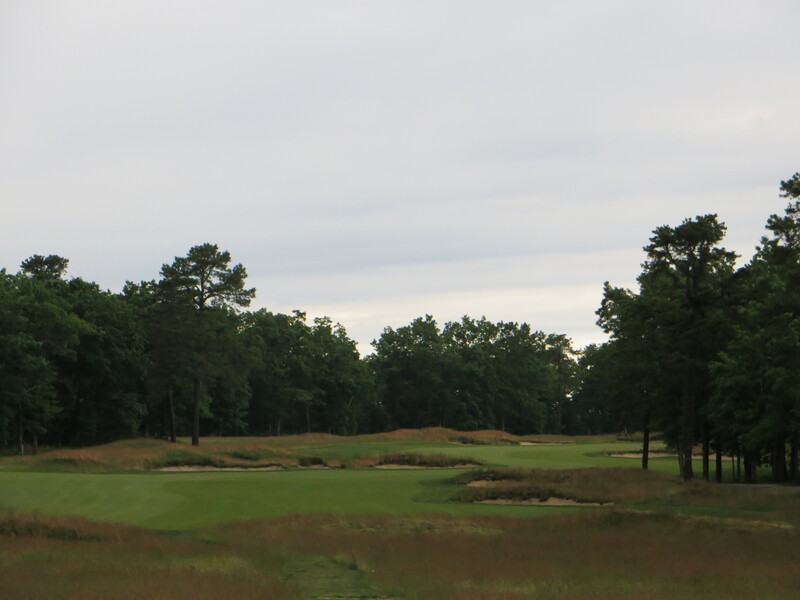 Tillinghast knows how to challenge a player without overwhelming them-it is always a pleasure to play his courses because they have the visuals to wow you but plenty of opportunities to succeed if you play with good judgment. Bill Coore was asked by a wealthy New Jersey real estate developer, Roger Hansen, to create distinctive golf course on 750 acres of sandy rolling pine barren woodlands he acquired outside of Atlantic City. He had in mind a golf club in the Pine Valley tradition-a private haven where wealthy people with presence in this area could entertain their friends and colleagues with the highest standard of golf, food, and accommodations in a casual environment without pretense. Coore spent a considerable amount of time walking the ground before a contract was prepared and determined it offered an opportunity to create rustic walking course with a character unique to this region. There was enough elevation change in the property to make holes with distinct topological interest and plenty of natural vegetation to provide the look and feel of an old English heathland course. Coore and Crenshaw embrace the old style principles of great designers of the golden age providing plenty of room to play the course and generous access to the greens. There may be ferocious bunkering on one side of a fairway or green but you will rarely see both sides cordoned by trouble. This makes the play much more enjoyable for the recreational player who does not want to take on the macho challenge. Like many of the great courses of that period, playing this course well is about thoughtful tactical intention with adept execution of the shots required. They created big set backs for the holes from the existing trees-this makes for an enhanced canvas on which to present the holes. 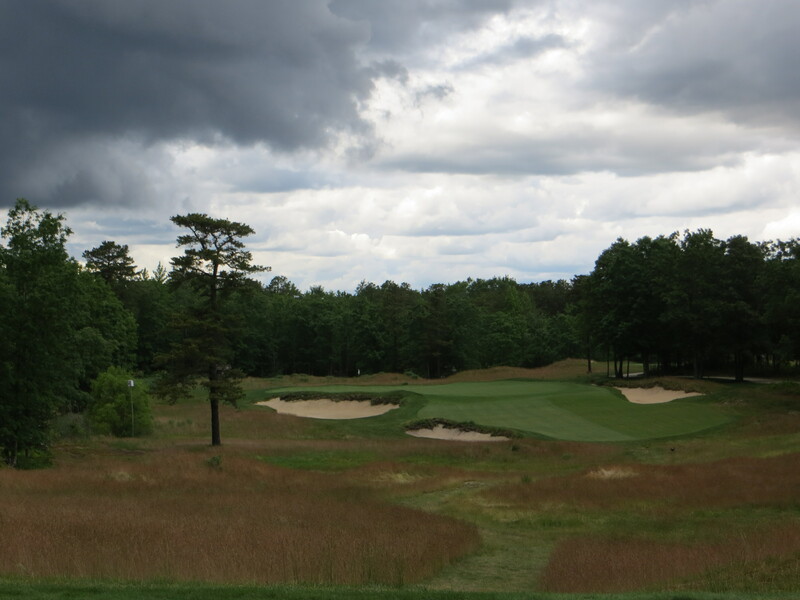 Lush bent fairways throughout set against gold fescue grasses make for a beautiful presentation. The most distinctive characteristic is the seemingly random mounding and bunkering that provide most of the hazards. There is no water in play on the course-they did not route any of the holes through the wetlands that take up almost half of the property. The randomness of the placement of the hazards defies the symmetrical look of so many modern designers and it makes the playing lines infinitely more interesting to discern as you plan your shots. There are over 100 bunkers on the course and they often have eyebrows of natural long fescue reminiscent of Royal County Down-this makes them very intimidating looking from afar as well as difficult from which to extricate yourself if you are too close to the front of the bunkers. Pay particular attention to the relative position of the hazards to the landing areas and greens. With some optical trickery they can seem more imposing than they really are-there is often more wiggle room in the formula than meets the eye. I found the mystery of the greens particularly intriguing. These are big, sprawling oceans of green with pitch and undulations that will confound you both on your approach shots and your putting. Local advice is essential until your personal knowledge of the greens is up to speed. These guys have real genius giving you plenty of room to approach but giving you little room to approach successfully. You can hit what seems like a wonderful shot that seems to randomly separate from the hole against all your intentions. The greens roll very nicely and have lots of speed, especially down hill. This is not really a set of greens that call for a nickel defense but you have to be careful when the speed conditions of a particular putt are at the optimum. What is an architectural accomplishment of no small order, given that the property itself does not have inherent dramatic topography, is no two holes on the course look remotely similar. You cannot anticipate what is coming next because there is no pattern to the sequence or the hole designs. The sequencing of the holes is brilliant, you might have a monstrously long par four followed by a short pitch par three or a reachable par five. This keeps the player off balance because the challenges vary dramatically from hole to hole. The entire facility is top notch. The locker room, eating facility, and practice facilities are as good as any high end club you will visit. Like you would see at Pine Valley or Caves Valley they built very nice lodge to accommodate out of town guests in for a multi-day visit to the club. You are going to need an invite to get here but if you can find one you will not be disappointed in what they have created. Somerset Hills represents the old and traditional with a discrete clubhouse and civilized and understated approach to everything. At Somerset Hills, they don’t have to try to impress, because they are the genuine article. 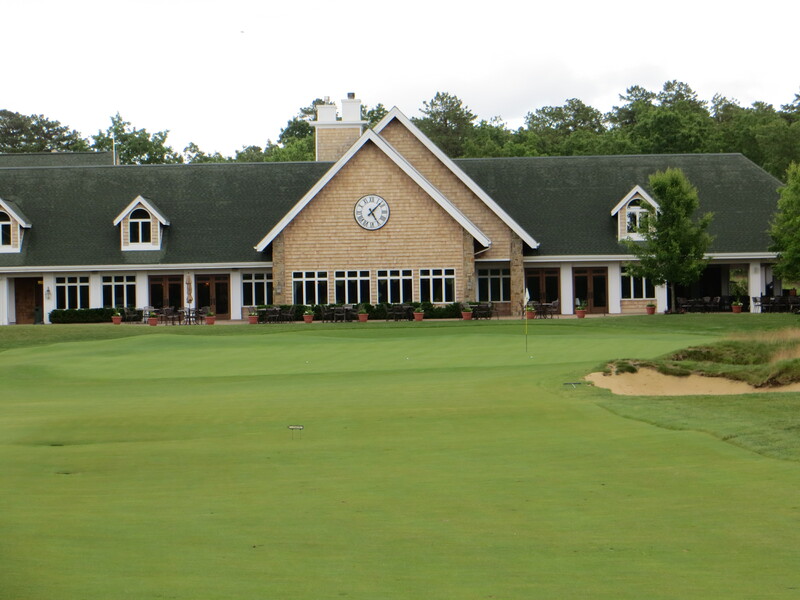 The small clubhouse, pro shop and outdoor deck fit perfectly into the New Jersey small town landscape and have an aura that can’t be bought and only develops with age and a respect for the past. The course has a number of perfectly manicured grass tennis courts, confirming its gentrified and genteel approach as a private club. Even the halfway house is just some bottled drinks, ginger snaps, crackers with add your own cheddar cheese or peanut butter. Pick up the yardage book-it is a collectible relic all to its own. An appealing aspect of A.W. Tillinghast’s work is, strangely enough, the lack of identifying characteristics. The player would be hard pressed to tell that the same architect designed the courses at Winged Foot, Baltusrol, San Francisco Golf Club, Bethpage (Black) and Somerset Hills. Think of the striking features of each: Winged Foot (West) with its length, raised, severe greens and deep bunkers; Baltusrol (Lower) with its low-profile look; San Francisco with its flashy bunkers stylishly spread at all sorts of angles in the broad fairways; Bethpage (Black) with its huge, sprawling scale and Somerset Hills with its terrific set of greens and its charming layout. 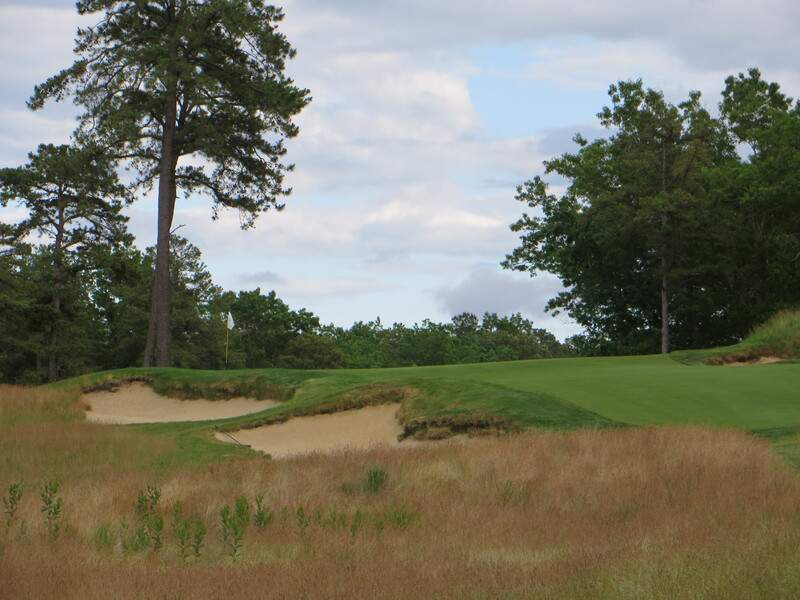 Tillinghast’s style (or lack thereof) is an indicator that, unlike many of today’s architects, Tillinghast was not hell-bent on leaving his ‘mark.’ He fit the course onto the available land without forcing his imprint onto the land. Variety is the key to Somerset Hills- variety of terrain, variety of length of holes, variety of approach shots and variety of greens. With the fairly open front nine laid out on and around an old racetrack and the back nine through rolling wooded terrain with streams and a pond, one would think the course would have a Jekyll and Hyde character. However, the course flows well, the par threes are perfectly balanced at 175, 220, 145 and 165 yards while the par fours have several big two-shotters (the 1st, 4th, 7th and 13th), several short ones (the 5th, 17th and 18th) and those very appealing ones in between. Par fives may be the weakest holes but they are not without feature interest themselves. These greens are unlike anything we see today-they are severe, almost random in their severity-full of odd humps and bumps and an occasional unplayable section. To play well here a player must pay attention to the specifics of each green and know where to leave it and where not to leave it. If the greens are carrying any speed the day you play them this goes double. For the really discriminating golf mind this is a very special place to play. It is just a delightful sequence of interesting golf challenges and it is totally playable even the first time out. It is simple, unchanged from its original intent, just a bottled piece of the past.